Obama looked very stiff especially when they started to pray... Political move for the mid-terms?. Washington, DC â€“ Over forty years after Chief Master Sergeant Richard Etchbergerâ€™s heroic death in the Vietnam War, the White House recently announced that the Medal of Honor will be awarded posthumously to him on September 21, 2010. Congressman Earl Pomeroy worked to secure authorization for the Medal in a bill signed into law by President Bush in October of 2008. Etchberger and his fellow men were stationed at Phou Pha Thi, known as Lima Site 85, which was a secret radar base in the neutral country of Laos. From the base, Chief Etchberger and his fellow men were able to pinpoint hundreds of bombing targets in North Vietnam for the U.S. military. On March 11, 1968, North Vietmanese commandos stormed the radar station, and Chief Etchberger led several men to a ledge where they fought off the Vietnamese commandos and awaited helicopter rescue. Chief Etchberger deliberately exposed himself to enemy fire in order to place his three surviving wounded comrades in rescue slings, saving their lives, but was fatally shot in the helicopter as it carried him and his fellow men away. Chief Etchbergerâ€™s sons, Cory Etchberger, Richard Etchberger and Steve Wilson will join the President at the White House on September 21st to commemorate their fatherâ€™s example of selfless service and sacrifice. Yeah... he's a pious patriot alright..
As a Harvard-trained lawyer, are we really to believe that BHO II forgot the most famous line in the Preamble of the Declaration of Independence? There are only three options that explain why Obama omitted the words â€œby the Creatorâ€� in his speech to Hispanics over the weekend. 2. The teleprompter was loaded correctlyâ€”and Obama misread it, omitting the words â€œby the Creatorâ€� accidentally. 3. The teleprompter was loaded correctlyâ€”and Obama omitted the words â€œby the Creatorâ€� intentionally. The first possibility illustrates cowardice by Obamaâ€“ if â€œby the Creatorâ€� was omitted by a speechwriter (and not ordered so by POTUS) then why arenâ€™t heads rolling? The second option would illustrate ineptitude on the part of the Harvard-educated â€œconstitutional lawyer.â€� If â€œby the Creatorâ€� was in the teleprompter, and Obama â€œforgot,â€� then it is a gaffe to remember, such as his â€œ57 statesâ€� remark during his campaign. Where are the Dan Quayle genre jokes by late night television folks mocking his stupidity? Donâ€™t suppose weâ€™ll hear much from the LSM about that one! The third option illustrates arrogance in BHOâ€“If the teleprompter was loaded correctlyâ€”and Obama omitted the words â€œby the Creatorâ€� intentionally, then who, exactly does he think he is? Would the same media that is jabbing conservatives for their complaints refrain from complaining if, say, Sarah Palin forgot to mention the First Amendment (free speech, press, religion) when reciting the Bill of Rights? Ever get the feeling Oby doesn't care much for the Christian religion. Just to add, when the national anthem was played both he and Michelle held their left hand over their hearts. This man showed true courage saving his mates. Not to go off the map but Laos is not mentioned a heck of a lot is it. The leader of the Hmong Armee Clandestine was the General, legendary Among his people, named Vang Pao. He and his forces were loyal allies to the whims of the United States. "Vang Pao had a commitment to his people and his country, and beyond that he had a commitment to the Americans" (Hamilton-Merritt). This commitment was very costly for the Hmong. During the war "more than 17,000 soldiers and 50,000 civilians had been killed" (Herring, 300). Indeed, "Hmong soldiers died at a rate about ten times as high as that of American soldiers in Vietnam" (Fadiman, 129). In 1973, soon after the United States agreed to withdraw its forces from Vietnam by signing the Paris Agreement, Prince Souvanna Phouma, the Prime Minister of Laos, met with Henry Kissinger in Lao capitol Vientiane. The Prince told Kissinger that the "very survival of Laos" was on the soldiers of the Americans. Henry didn't give a muck. A prominent Vietnamese blogger known as 'Mother Mushroom' was jailed for 10 years on Thursday, her lawyer said, during a brief trial rights groups decried as "outrageous". 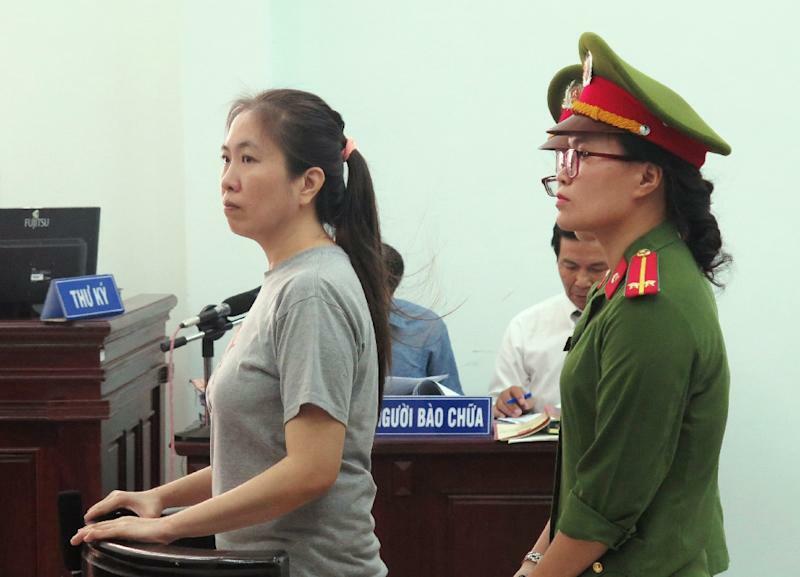 Nguyen Ngoc Nhu Quynh, whose pen name derives from her daughter's nickname "mushroom", was arrested in October 2016 and later charged with anti-state propaganda over critical Facebook posts about politics and the environment. Vietnam's one-party state keeps a tight clamp on dissent and routinely jails activists, bloggers and lawyers who speak out against the communist regime. The 37-year-old blogger faced a maximum of 12 years in prison, and her lawyer said the heavy sentence she received at the closed-door trial was "harsh". "I am not happy with the result of the trial today," Nguyen Kha Thanh told AFP, adding that Quynh would likely appeal.